Tithing. Do you give of your first fruits or of your last fruits? Wikipedia: tithe (pron. :/’taiõ/; from Old English: teogopa “tenth”) There is much debate in the church today about whether the “tithe” is even a principle for today. It is only mentioned seventeen times in the Old Testament. For my article I prefer to use the words “tithe” and “giving” as synonyms. 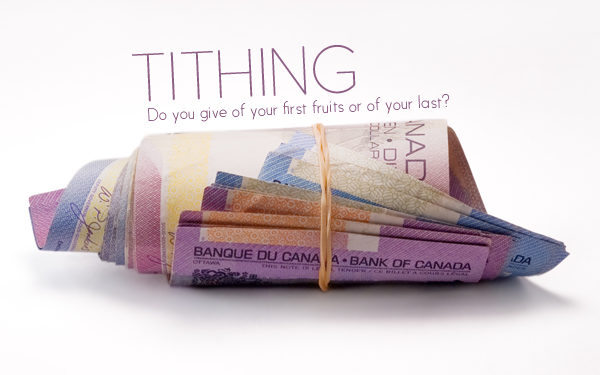 First, let’s look at the purpose of the tithe. The main principle behind tithing and giving is the fact that what we do with our money shows where our heart is. Matthew 6:21 says, “For where your treasure is, there your heart will be also.” When we are able to give ten percent or more of our income instead of keeping that money for ourselves, it shows that our heart isn’t tied to our money and that we love God more that our money. The Bible mentions money over 800 times and of all of Jesus’ parables, more than half of them speak about money. Why? Because this is where so many people get tripped up! When we are able to give at least ten percent of our income back to God, our money doesn’t have as tight a hold on us because we realize that God is in control of our finances. Then we remember that everything we have has been given to us by him. Even though most of us probably work for the money we make each month, God still has his hand in it – he has given us the ability to do our jobs. Many who grasp what God has truly given them seem to agree that ten percent doesn’t even feel like it is enough! The Lord gives us everything we have (Psalm 24:1); through giving he is not asking for much in return – just a portion! Do you give your gift first? Or do you pay the mortgage, hydro, cable or satellite, food and then give the Lord whatever is left? Is your lifestyle made up of wanting certain things or wasting money on frivolous items thus preventing you from your giving responsibilities to the Lord? These are questions members of God’s church must ask themselves (and answer). Paul gives some instructions about giving in 1 Corinthians 16. Giving should be personal. “Each one of you should . . . . “ Giving is the privilege and responsibility of every Christian, young and old, rich or poor. The benefits of giving are intended for each person to enjoy. Giving should be periodic. “on the first day of every week . . . .” The Lord understands that we need to give regularly helps draw us consistently to Christ. Our local church also needs to meet its regular financial commitments; we need to be consistent in helping meet these commitments. Giving should be out of a private deposit. “Put aside and save . . . .” Whether you set aside a separate checking account, or a cookie jar; the most gratifying part of setting aside money is the thrill of praying that God would make us aware of needs and then enable us to respond. Giving should be premeditated. To know the full job and reap the blessing of giving, it must not be done carelessly. “Let each one do just as he has purposed in his heart; not grudgingly or under compulsion; for God loves a cheerful giver” (2 Cor 9:7). Our giving should involve though, planning, and prayer. The supreme example of premeditated giving was set by our Saviour, “For the joy set before him he endured the cross” (Heb 12:2). With Integrity. Our integrity often meets its match in money matters. God calls on us to be honest even in those small details that we could easily rationalize away. Heavenly riches are far more valuable than earthly wealth But if we are not trustworthy with our money here (no matter how much or little we have), we will be unfit to handle the vast riches of God’s kingdom. If you refuse to let your integrity slip in small matters, it will not fail you in crucial decisions later on. Do you give of your first fruits or of your last fruits?